I have seen many, many examples of Washi Tape magnets online and I wanted to make my own! I plan to make these for my team at work before school starts! I used Pear Pizzaz as the base and stamped the flower from Embellished Events (#126497/ $20.95 clear) in the same color. I punched out the tiny flowers from the Itty Bitty Shapes Punch Pack (#118309/ $16.95). I just LOVE the new candy dots - I used both Melon Mambo and Daffodil Delight in the centers of the flowers. I stamped the sentiment in Melon Mambo ink using the stamp from the World Treasures set (#126767/ $17.95 clear). I cut it out with the matching framelit from the Apothecary Accents Framelits Set (#127003/ $24.95). Who wouldn't love to receive this as a little gift? Make a comment and I will randomly pick one winner to win a set of Washi Tape clothespins and one set of Stampin' Up! Washi Tape!! (You must be a follower of my blog to win so I know who to email so please add yourself as a follower!!! THANK YOU!) You must comment by tomorrow, August 1st at 8pm EST! Guess what I have to show you tomorrow? Another Washi Tape exmaple! Yay! Thanks for reading my blog... catch you tomorrow for more "tape" fun! Great project, Pam! I love washi tape. So cute. I'm on a washi tape roll these days.....LOL. Hello Friend!! I love this project! I'm new to washi tape and this project looks sooooo fun!! Great blog and I'm a new follower! 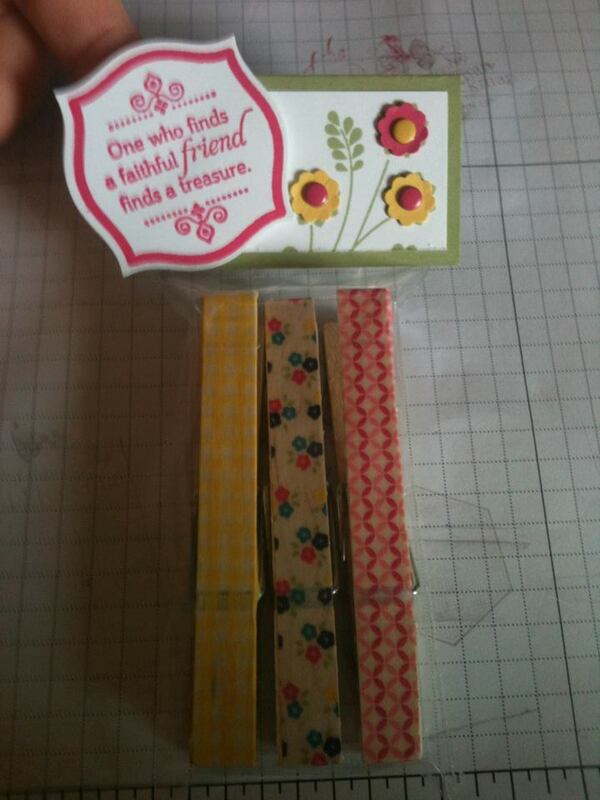 What a cute idea to use the Washi tape. I haven't tried the tape yet. Cute project.. Will make a great gift idea for some teachers I know. Thanks for sharing your ideas. Adorable! Love them! Thanks for the chance to win an awesome giveaway! that is a really cute gift pack! Your projects are always interesting and pretty!